16 pp. Roman, 577 pp. Nilo-Saharan is one of the four major language families on the African continent. It extends eastwards from the Niger to Western Ethiopia and further southwards to Northern Tanzania. Whereas the status of Nilo-Saharan as a phylum has been largely accepted since Greenberg (1963), the internal classification has remained controversial. Greenberg included Songhay in the Nilo-Saharan family, others regarded it as an isolated language or even belonging to the Chadic languages. Proceeding on the background of the controversial discussion and on the basis of his own sources, the author of the present volume attempts a further in-depth analysis and a new historio-linguistic classification of Songhay. In the first place, he critically discusses the genetical proposals for classification of Bender (1997) and Ehret (2001) before analysing the lexical relation of Songhay with Afro-Asian languages which hitherto have not been paid much attention to. He thereby concludes that Songhay is not a member of the Nilo-Saharan language family, but instead stands in a certain non-genealogical relation with the Afro-Asian family that has to be determined more specifically. This assumes an old situation of contact between Songhay and the Afro-Asian languages. 1. in the empirical range: The global connection of the alleged Nilo-Saharan family and the methods of their construction are questioned. At the same time the necessity emerges to develop a new research field which applies on the dynamics of contact between the Afro-Asian languages and the adjacent Sub-Saharan languages. 2. in the theoretical and methodological range: It can be observed that the classical methods of historical comparison of scriptless languages are limited and that the uncritical application bears the danger of false reconstructions. 3. in the anthropological and ‘historical’ range: This study shows how new and more precise research approaches contribute to clarify the socio-cultural processes resulting from this contact zone in Africa. In the course of his work the author analyses how dialectological, areal and stratificatorial aspects have an influence on the dynamics of historical language development. He stresses the risks of fixed reconstruction patterns a historio-comparative scientist has to deal with. For Nicolaï language contact and multilinguality are the main explanations for language development. In spite if its title, this is a book on Songhay. Its author, professor at Nice university, is among the world’s greatest specialists of this language family, and has written an impressive series of articles and books – impressive both in quantity and quality – on questions of Songhay linguistics, Songhay linguistic history, and the theory and methods of linguistic comparison. 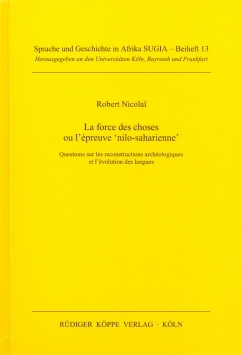 The present book is a sophisticated sequel to Nicolaï (1990), where he explained, among others, his view of the linguistic origin of Songhay.